The summer term is now in full swing, with many students working hard on final assignments, projects and dissertations. 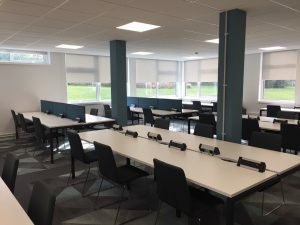 As the Large Lecture Theatre is now no longer in use until the start of the 2018-19 academic year, there are around 800 spaces available in the URS Building (there is a limit on the total occupancy of the building for fire safety). 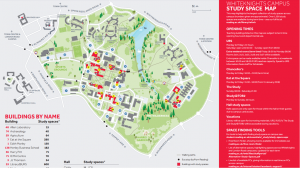 RUSU’s The Studyand The Study@TOB2: Study spaces available for all campus card holders. Central Room Booking service: Students can book rooms on campus in advance, for example, for group study. With exams and final projects on the horizon, it’s really important to be fair and considerate when using study spaces around campus. Demand is high at this time of year, so please treat all spaces, fellow students and staff with respect. NOISYCHAT service in URS Building: If there is noise in a silent study area, students can use this service to text Library staff so that noise can be investigated. Consider altering patterns of study: Our records show that 3.30pm is when URS is at its fullest, with space freeing up as the afternoon goes on. It may be worth looking for space before or after peak times – early morning and after 5pm are usually quieter than midday. Don’t be shy: When demand is high, it’s vital that space is used as efficiently as possible. So please don’t be afraid to sit next to someone you don’t know – make use of the spaces that are available, and if studying in a group, consider splitting into smaller groups if it makes finding space easier. This entry was posted in General news, Study Space. Bookmark the permalink.